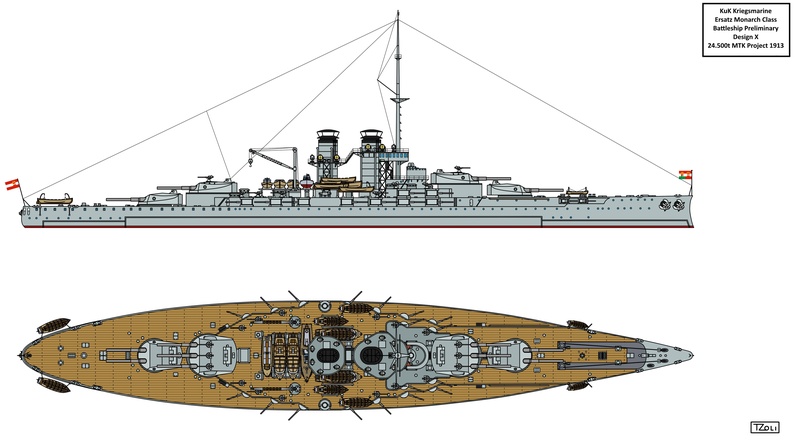 While the Ersatz Monarch class battleships is mostly likely the most well-known never-were project of the Austro-Hungarian Navy (Kaiserlich und Königlich Kriegsmarine), the history of the class and the other design variants considered are rather difficult to get knowledge of. 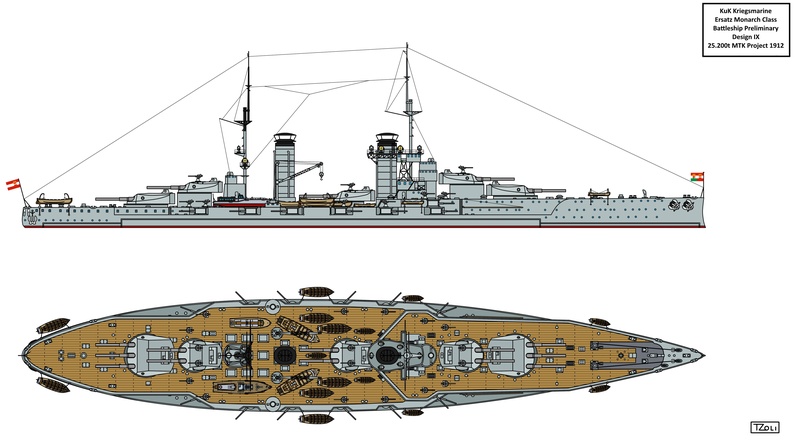 Not only because the troubled history of the Austro-Hungarian Empire and its successor states (Ships designed by Vienna and the various shipyards of Croatia and parts of nowadays Italy, Armour produced by Vitkovice in Silesia and Main guns produced and developed by Skoda in Bohemia (today Czech Republic), while engines and smaller calibre guns produced by Ganz-Danubius, Budapest, Hungary) in the past 100 years, but the documents of the ships might ended up in various parts of the old Monarch due to their contribution of the development and construction of the ships. Meaning while most of the documents were held in Vienna (Austria), some documents could be found in Budapest (Hungary), Pola and Zagreb (Croatia), Venezia (Italy) or might be even in Prague (Czech Republic). None the less due to some Hungarian and Italian Naval enthusiasts as well as sheer luck I was able to collect as much info as I could. In case of the name formally this new class of battleships were never called Ersatz Monarch class, but rather as Projects like I, II, III etc., Enlarged or Improved Tegetthoff type or by their tonnage like 23.400ton battleships, 24.500ton battleships and so on. The name Ersatz Monarch (Replacement Monarch) originated from the leading article of August 1913 number of “Die Flagge”, the monthly magazine of Austrian Navy League: “The Monarch class must be replaced.” and hence the name Ersatz Monarch survived to this very day describing the last ordered battleships of the Austro-Hungarian Navy. The displacement was limited by the lifting capacity of Drydock No.1 of 23.800tons. 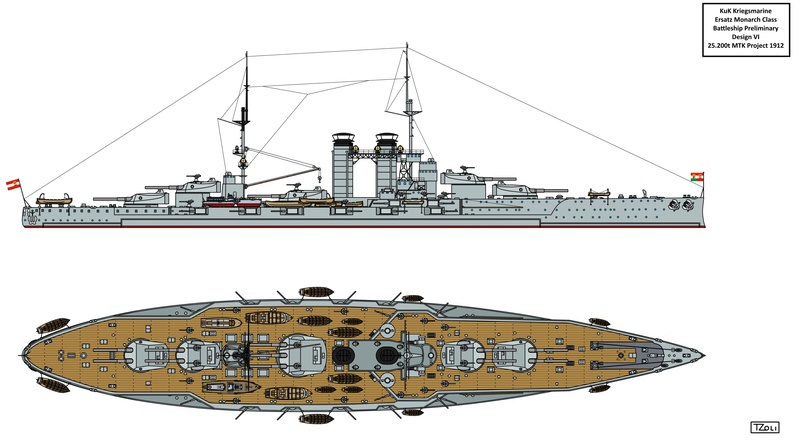 In April earlier of that year, Skoda offered plans of a new heavy gun a 34,5cm one in twin and triple turrets as well as ideas for a new battleship arguing with the necessity of securing high skilled workforce and ensuring development continuity. The 7,5cm/50 gun was a new development which did not entered production but it was in par with the other navies 76mm or 3” guns used mostly for Anti-Torpedo Boat, Anti-Destroyer and Anti-Air weaponry and would had provided better protection for the ships than the previous 7cm (66mm) guns. 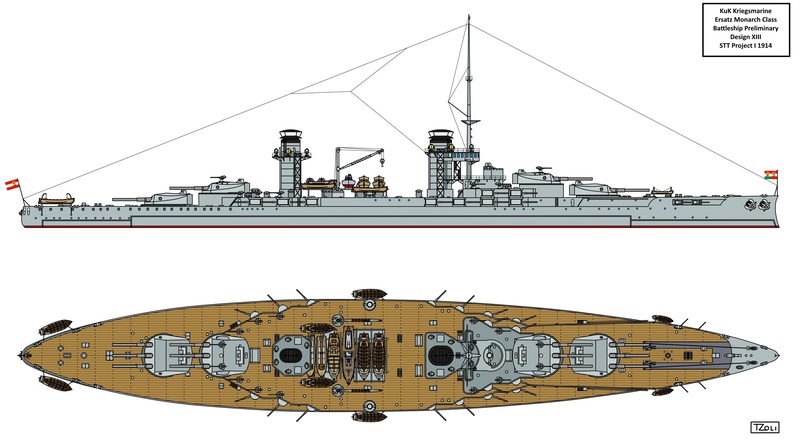 Later the 7,5cm L/30 K16 gun developed by Skoda was used onboard submarines, destroyers (Warasdiner, Huszár class) and gunboats as AA guns and might had been developed from this earlier 7,5cm gun. To counter the influence of Skoda, the Naval Ministry ordered a new set of designs in early spring of 1912 with armaments minimum of 8x either 34,5cm or 35,5cm cannons (Skoda was ordered to develop guns and turrets for this new calibre as well) with new tonnage set to 23.400tons. 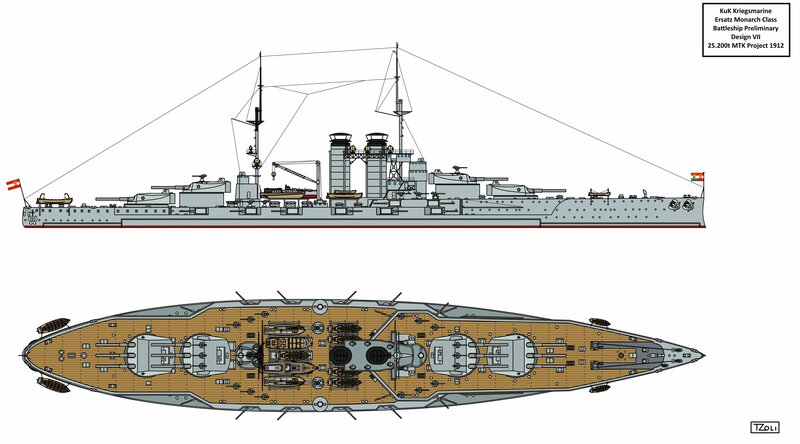 Though Skoda could not provide drawings and data of the 35,5cm guns and turrets in time so most of the Shipyards used 34,5cm guns for their proposals. 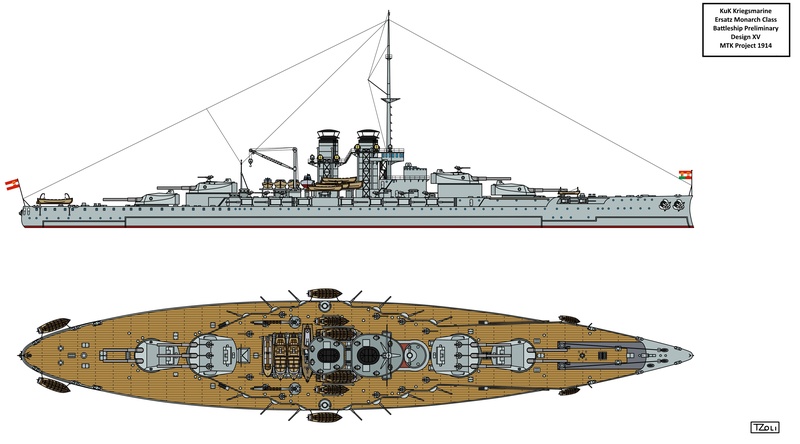 With this new specifications in mind no less than 26 design proposals were made by the various shipyards ranging from 8 guns to 13 guns, from 161 to 175m in length, displacements of 23.400 to 27.000tons and armour ranging from 280mm to 340mm belt and 38-64mm deck. Sadly most of these designs precise data as well as their drawings I could not acquire (if still exists) and hence I only draw the MTK variants for which I have more accurate data of. 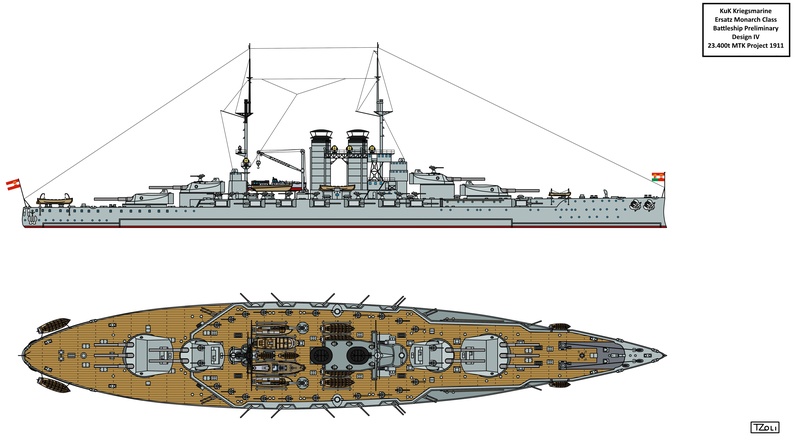 In case of the 8 gunned 23.000ton designs I’m not sure the accuracy of either the tonnage or the amount of guns carried because on 23-24.000tons the Royal Navy able to produce ships: Orion and King George V class, HMS Erin with 5x2 343mm (13,5”) armament on a same hull size and belt armour but thicker deck armour and faster speed of 22knots. After these new set of requirements were formalised, the 3 shipyards were asked again but sadly I have only info on the MTK proposals as well as a single design from Ganz-Danubius. 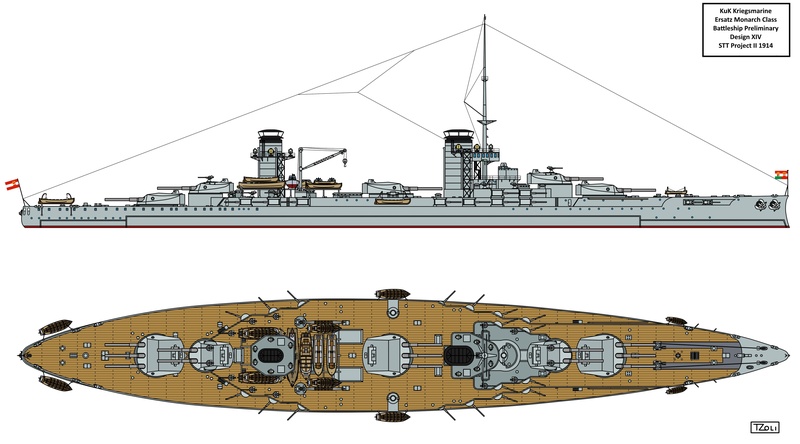 The Ganz-Danubius proposal is a bit different from the other designs as it was shorter but beamer resulting in a more stable gun platform but required a stronger engine due to the worse beam to length ratio and would had a single funnel. The MTK proposals were preferred and most have two versions done: one with superfiring triple the other with superfiring twin turrets also introducing casemates on two levels front to maximize forward fire. While the Naval Ministry preferred superfiring twin turrets as they know the results of the trials done by SMS Viribus Unitis and SMS Tegetthoff which showed that these ships were top heavy (which is more about maximum weaponry on a limited displacement as Viribus Unitis class was the smallest battleship design which could carry 12x 30,5cm cannons) still the designers offered superfiring triple turrets as these showed better lines for the curves of the hull front and aft and also reduced citadel width which was also saving tonnage. 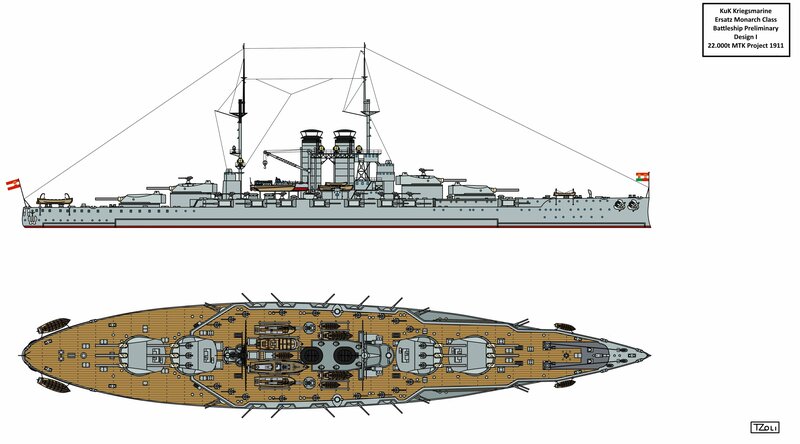 On the other hand superfiring twin turrets would result in a more stable gun platform due to the less topweight the twin turrets offered. 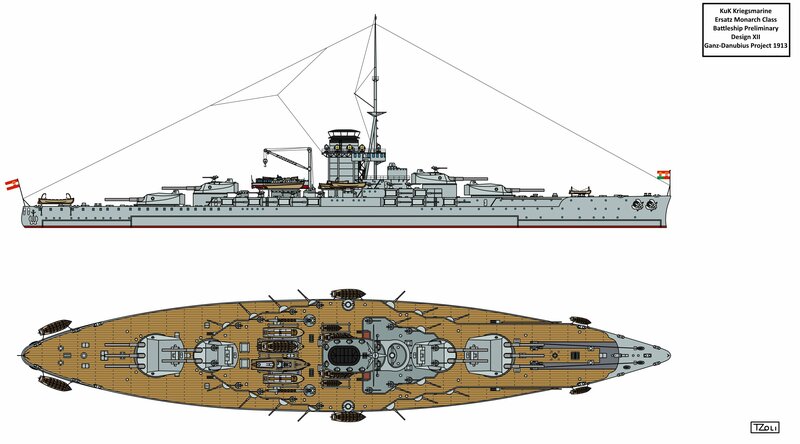 On 23rd April 1913 the Command of the Navy ordered the NTC to rework the January 1913 design: after some weight saving modifications it had to thicken the armour of the belt, the barbettes and the conning tower. In addition, it had to completely redesign the electric system of the ship and thus Project XI was born.